Aaaah, karma, you syrupy sweet vixen, you... and this young fella has felt its warm, warm embrace after a fairly major brain snap last week. 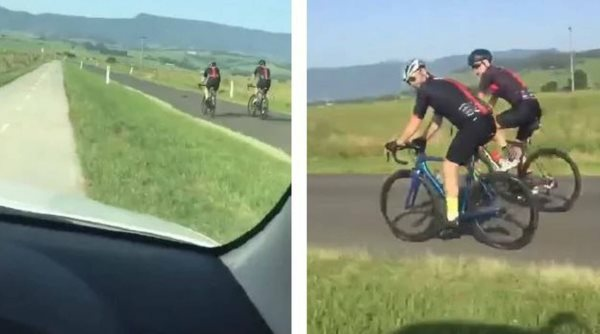 About a week ago, young NSW local Thomas Harris - for whatever reason - thought he'd post a video of himself driving on a clearly marked bike line as he passed two cyclists riding (completely legally, it should be pointed out) on a country road near Jamberoo in NSW. “What's the point of us spending this money if you’re not going to use it [the shared path], you f---ing d---heads,” Harris shouted at the two bike riders. One of the cyclists invited him to stop for a chat, but Harris declined, instead offering more abuse and continuing to careen down the bike path. This is where it all gets a bit delicious. It turns out that the two riders are actually police officers. The youngster handed himself into the local police command, where he was issued with a court attendance notice for using his phone while driving, offensive language, and for driving on the path. And for those of you who think the cyclists were in the wrong? Think again. NSW road rules stipulate cyclists can ride two abreast on a road, but no more than 1.5 metres apart. Cyclists are required to use a marked bicycle lane, unless impracticable to do so. However, the Jamberoo path in question was a shared path, not a marked bicycle lane. Of course, people being people, the incident has kicked off a massive furore on social media, with a fund being set up to pay Harris's fines. My two cents? Cyclists are humans - sons, dads, mums, mates - and while their behaviour can irritate, NO ONE deserves to be abused, injured or killed while legally using a roadway.